This is one of the books we currently have out from the library, and I love it so much that I decided to post about it right away. 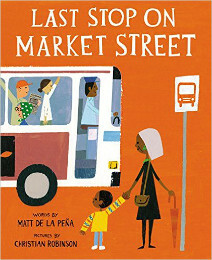 It is a sweet story about a little boy riding the bus with his grandmother, but what makes it so special is the way it captures the rhythm of the city, and the way it straight-forwardly includes aspects of city life that most books either skip or gloss over. The story is told from the point of view of a little boy named CJ, and his voice reads true. The wisdom comes from the nana he’s traveling with, and her voice reads true, too. She has the sort of answers you hope to come up with when your kid confronts you with a potentially hard question, and delivers them in a way that feels natural, not preachy. The illustrations are beautiful, too. I think this book made a big-ish splash when it first came out, and I can see why. It is a delight.